CHHA Vancouver is looking forward to hosting another exciting programme for you all! The first event of the year will be a session by Kathy Pichora-Fuller on Aging Well with Hearing Loss. Research suggests connections between hearing loss and age-related physical and psychological health issues, including dementia, social isolation and loneliness. Finding explanations for these connections could help individuals, clinicians and policy makers to find solutions to promote healthy aging for people who are hard of hearing. One hypothesis is that hearing loss increases a person’s risk of social isolation which in turn increases risk of cognitive decline. Data from the Canadian Longitudinal Study of Aging show a connection between hearing and cognition, a connection between social engagement and cognition, but only weak support for the hypothesis that social engagement explains connections between hearing and cognition. Early data from the Canadian Consortium on Neurodegeneration in Aging for older adults seen at memory clinics show differences in cognition depending on hearing. The discussion will explore what this research may mean to CHHA members, goals for future research, and possible implications for healthy aging. It’s our favourite time of the year! The CHHA Vancouver Branch is looking forward to hosting our 8th Annual Walk2Hear walkathon on Sunday, September 23, 2018. Please help us raise funds for our activities and join us in our annual Walk2Hear to connect with each other and to enjoy a walk together! Go to https://www.canadahelps.org/en/charities/canadian-hard-of-hearing-association-vancouver-branch/p2p/walk2hear2018/ to sign up as a Walk2Hear participant or to donate to a participant! The registration fee for the Walk is $10. There will be a draw of present registered walkers for the grand prize of two Economy Class return tickets for travel to any Air Canada scheduled destination in North America (including Hawaii). Travel must be completed one year from the date of the event, blackout periods apply and the winner must abide by the conditions of the prize. The draw will take place around 2:00 pm on Sept. 23 after the walk. Weather Conditions: Walk2Hear 2018 will take place rain or shine. Please check the weather forecast and dress appropriately. For more information please contact CHHA Vancouver at chhavancouver@gmail.com. Hearing in venues such as restaurants, performing arts theatres and churches are a challenge for many hard of hearing persons. Few such venues have adequate sound and listening systems. The provision of speech-to-text or captions in public venues is virtually non-existent. But, it doesn’t have to be this way! Hard of hearing persons are taking up the challenge to improve accessibility in their communities. The Vancouver Branch of the Canadian Hard of Hearing Association is embarking on a campaign to improve the hearing accessibility of community venues. Further, it has declared that the theme of its Fifth Annual Walk2Hear will be Improving Public Accessibility. Location: Jericho Beach Park, East End. The meeting place is between 2nd Ave. and Wallace Street. Registration: Between 9:00 AM and 10:00 AM; Walk begins at 10:00 AM. Note: Anyone of any age can register. Persons wanting to register or to sponsor a registered walker can just click on this link: Vancouver Walk2Hear – September 27, 2015. As well volunteers are welcomed – just sent us an email. For more information please contact: Ruth Warick, President of CHHA-Vancouver, at chhavancouver@gmail.com. 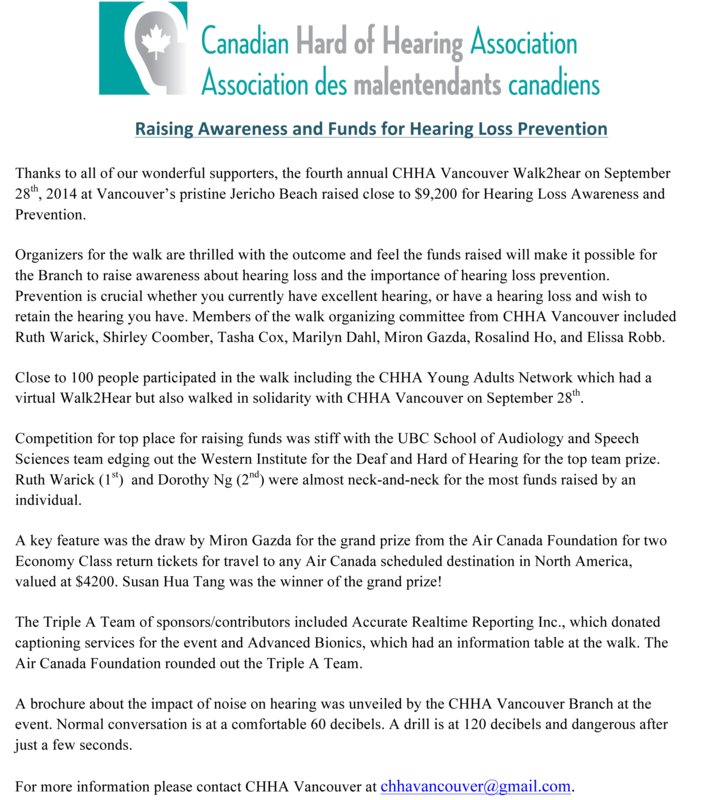 CHHA Vancouver Branch is pleased to announce that its next educational meeting will be on Hearing Loss Prevention. The Speaker will be Sasha Brown, M.Sc., RAUD /Occupational Audiologist at WorkSafe BC. Sasha Brown obtained her Master of Science (Audiology) from UBC in 2000 and has been working at WorkSafeBC since. She started in the Hearing Loss Unit working with people with Occupational Noise Induced Hearing Loss claims. She then moved to Health Care Services, where she oversaw the delivery of hearing aids, hearing aid services and batteries to those with accepted hearing loss claims. These two positions together allowed her to see the significant social and financial implications of Occupational Noise Induced Hearing Loss, and the need to reduce, or ideally, prevent its occurrence. Sasha is now in Prevention and Occupational Disease Initiatives attempting to impact the prevalence of ONIHL. Two Economy Class return tickets for travel to any Air Canada scheduled destination in North America (including Hawaii, Mexico, the Caribbean and select sun destinations). Travel must be completed one year from the date of the event and blackout periods apply. The approximate commercial value of the pair of tickets is $4200. 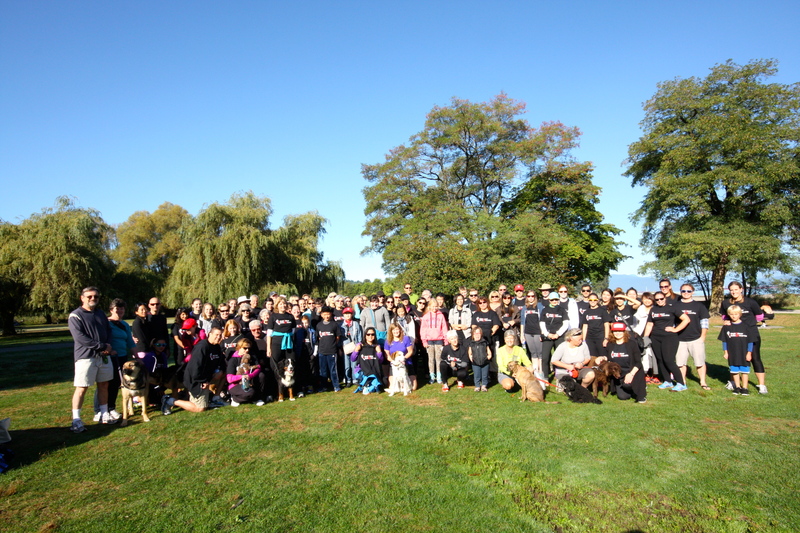 Our annual Walk2Hear will take place at Jericho Beach on Sunday September 28, 2014! See: https://chhavancouver.ca/walk2hear-vancouver-2014/. Walk2Hear videos are now posted.